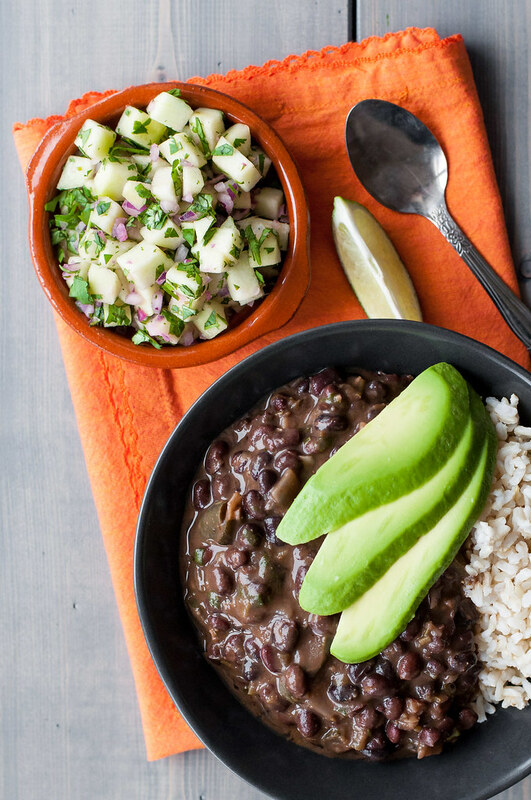 This black bean soup wasn’t always vegan. It started out as an ordinary weeknight dinner idea, something I probably found while sitting at the office. This was in my pre-Pinterest days, so of course I turned to one of my usual resources, Bon Appetit. 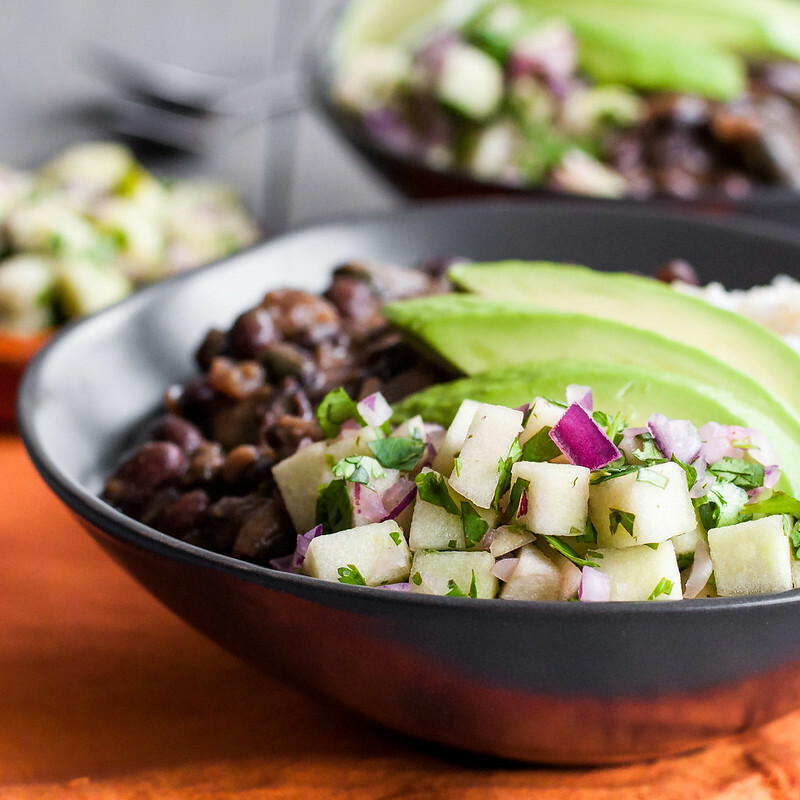 Black beans and rice with chicken and apple salsa sounded better and better as I dug into the recipe. Points for Mexican flavors, using an effortless rotisserie chicken, and containing easy-to-find, inexpensive ingredients, many of which I had in the house already. A conservative estimate is that I’ve made this recipe in some variation at least 20 times. 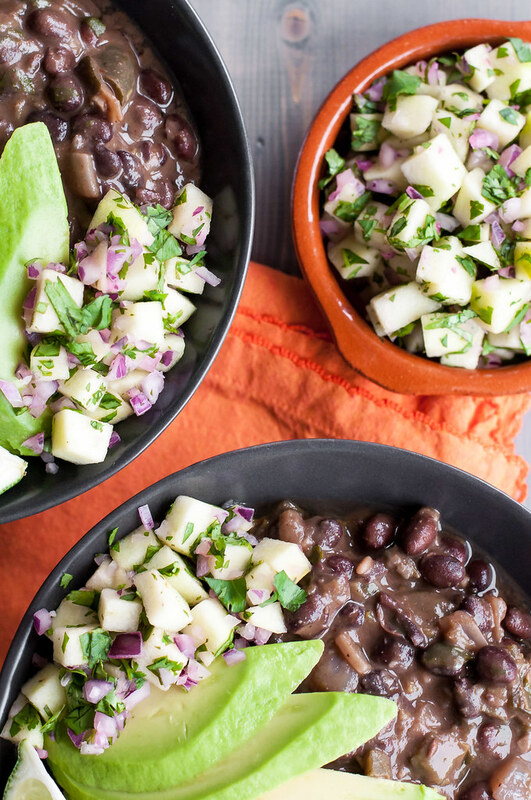 Not only have I assembled it per the original recipe, I’ve also used the apple salsa as a fun taco topping or simple summer condiment with baked fish, and any time I serve black beans as a side dish, you know it’s gonna be this preparation. They have cozied up to many a crock pot of pulled pork or pan of creamy enchiladas. As you might have noticed from the abundance of vegetarian recipes on NCK, though, fish and pulled pork are things I don’t make on the reg anymore (although I did do an all-out Mexican feast for NYE involving the latter). Did I drop my beloved beans, rice, and salsa recipe? Well, the salsa is vegan by default, so we’re safe there. But no, far from abandoning this international comfort classic, I started to change it up. I sometimes dropped the chicken, surprised how complete the meal was with “just” rice and beans. I switched out chicken stock for veg and tried some different types of peppers and onions. I started to just add the spices by feel instead of precise measurements, once I had the recipe unintentionally memorized. I’ve waited for just the right adaptation to share with you, and while I’ve found it in this soup, the possibilities for preparation and presentation are endless. Everyone should have recipes like this. 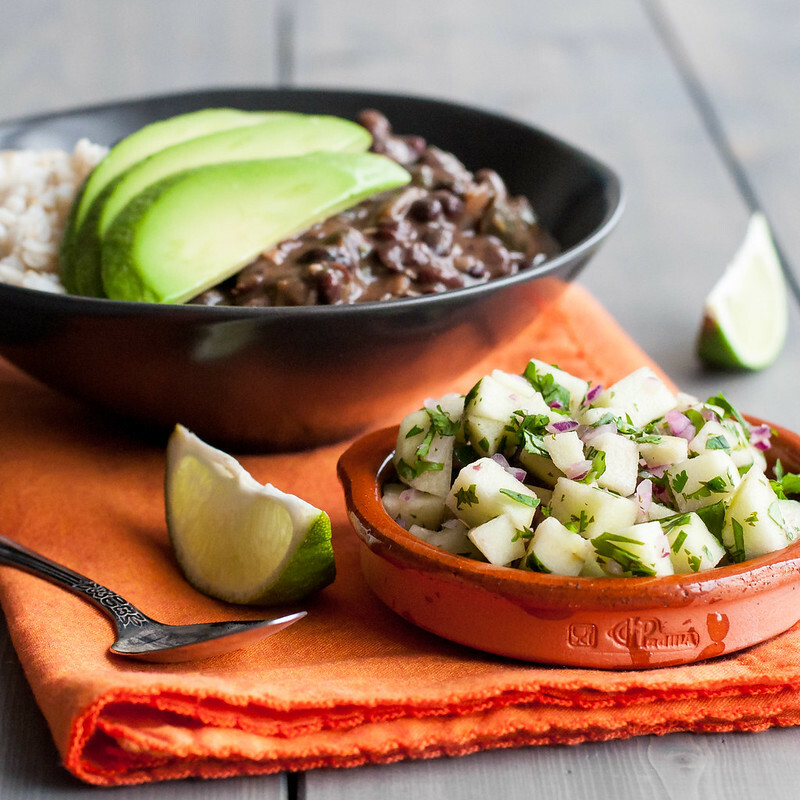 No, not big, bubbling pots of Mexican beans and rice (well, that too, actually), but recipes you’ve made so many times that if the internet or your recipe box went up in smoke, you could pretty easily reconstruct the dish from memory. That, I’ve come to understand, is how you really learn to cook. Four years ago, you would never have caught me saying this, but cooking is about experimentation (yes honey, you were right). However, I think that having the confidence to experiment comes from a place of understanding the “why’s” of a recipe you know and love. 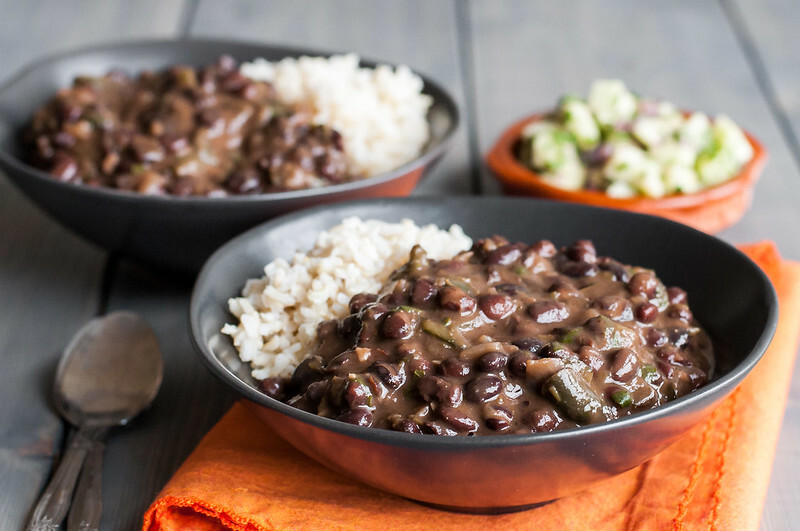 For instance, this black beans recipe, along with other soup recipes that I live for all winter, taught me the usual order of operations in constructing a soup from scratch. At it’s most basic level: aromatics/mirepoix, spices, liquids/large vegetables, tender vegetables, final seasoning. After seeing it done the same way in so many recipes, adding spices and garlic after cooking some onions became second nature. Sure, it’s ideal to understand the reason for this order (which I won’t bore you with), but even if you never get there, knowing the usual process will get you far in improvising dinner in a pinch. Theoretically, nothing in this black bean soup should be super spicy, but I warn you–watch the jalapenos. I don’t know if it’s a permanent thing, but those suckers have been SPICY for a while now. And not just the seeds. I talked to Tor last night, who told me all about the rave reviews she got at Easter for PW’s kale salad with the weird dressing combo that I now must try. Except it’s a good thing she put the seeded fresh jalapeno slices on the side, because they were dangerous. So it’s not just a weird east coat jalapeno thing–they’re at least in Oklahoma, too. This paragraph is turning out to be a bit of a grammar disaster, so I’m going to move on now. This weekend we head to Nashville! It’s not just a random weekend getaway–we have a lot to celebrate. My friends Melissa and Lee are getting married, Lee is turning 30, and sister Tristyn, who will also be in attendance, is turning 26! First, I think at that age it’s still appropriate to reveal her true age. Second, how did my baby sister get so…um…mature?! When I moved to Connecticut in 2011, I had just turned 26, and it’s just difficult for me to grasp baby T ever reaching an age beyond 23. Anyway, we’ll be missing middle T and doing some serious brunching in her honor this weekend at, supposedly, one of Nashville’s best brunch spots. More to come via Insta and, if it’s good (and I don’t have so many bloody mary’s that I forget to take pics), a blog review. 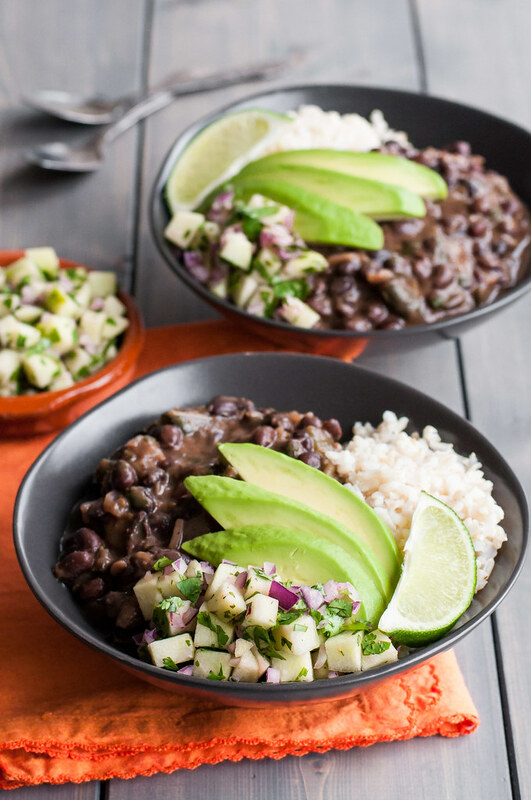 Hope you all have a fabulous weekend and find time to cozy up to some black bean soup, and a margarita thrown in (not to the soup) for good measure! Vegan Black Bean Poblano Soup and Green Apple "Salsa"
Poblano peppers look like large, dark green chile peppers. They're available in most grocery stores. While they have more pepper flavor than a green bell pepper, they're very mild. Most of the real heat in the dish comes from the jalapeno. If making rice with a long cook time, start it before the soup, so it's ready to serve when soup is done. Heat oil in medium saucepan or soup pot over medium high. Add red onion (reserving 2 tablespoons for the salsa! ), poblanos, scallions (if using), and jalapeno and cook until softened, about 5 minutes. Add garlic, chili powder, coriander, and cumin and cook for a couple minutes, stirring frequently. Add black beans and your choice of liquid, and raise heat to a boil. Reduce heat, simmering about a half hour, or until desired thickness is reached. Stir every 5 to 10 minutes, smashing some of the beans against the side of the pot with a wooden spoon (while holding the pot securely). This will thicken the base of the soup. When done, cool slightly, then add lime juice and zest, cilantro, and salt and pepper to taste. While the soup simmers, prepare the salsa. To serve, scoop a little rice to the side of each bowl, fill with bean soup, and serve with salsa and all the other optional condiments. Finely chop the reserved 2 tablespoons of chopped red onion--you'll want much smaller pieces than used for the soup. Combine with diced apple, cilantro and lime juice. Cover and refrigerate. This is a very flexible soup recipe. I've listed the scallions as optional, or you could use them instead of red onion. I love onion, so I used both. If spice isn't your thing, replace one or both of the poblanos with green bell pepper. If spice is your thing, add another jalapeno or up the quantity of spices. If you're really feeling adventurous, hit the whole thing with an immersion blender for a smooth soup. Have fun with it, and let me know your changes and how they worked in the comments! When mixed with lime juice in the salsa, the Granny Smith apple lasts several days in the fridge without browning, so feel free to make it in advance. Adapted from Bon Appetit, January 2012. The idea to include green apple in the salsa is so clever! Will definitely be making this recipe soon! Thanks Phoebe! I’ve visited your blog before and love it–thanks for stopping by to check out NCK! Thank YOU for visiting :) It’s one of those recipes that convinces me I might be able to become a full time vegan! The idea to include green apple in the salsa is great. I will try this recipe. You’ll love it (I hope)!